There are times when your child is perfectly well behaved. There are times when your child is nothing but a complete angel. You will be in a bustling coffee shop on holiday, you will put your baby in a highchair with nothing but some chopped banana to keep him entertained and he will be an absolute gem. You can both eat your lunch with two hands, your coffee will still be hot when you drink it and you will both be super relaxed, albeit with a baby covered in banana gunk (a price I am happy to pay). Pensioners will pass by and comment on how well behaved he is, what lovely blue eyes he has and what a total darling he is. You will beam with pride, fit to burst at the fact that you can take your bambino anywhere and he will behave. You will chuckle at aforementioned pensioners, comment cheerfully that “you should see him at 5am” then stroll away safe in the knowledge that you can now go somewhere a bit nicer for lunch the next day as he has passed the busy coffee shop on holiday test for three whole days in a row now. He is ready for the next stage in his holiday eating education, and you are more than ready for a meal that isn’t fish and chips or a jacket potato. Unfortunately for you, this will also be the time that your child will forget everything they ever knew about being a perfect little angel in a restaurant. So you can see what’s coming. We decided whilst on holiday in Devon to give The River Cottage Canteen in Axminster a go one day for lunch. Trip Advisor told me it was a relaxed restaurant, family friendly and a more affordable way to experience The River Cottage food and ethos without forking out to go to a River Cottage HQ dining experience. Whilst the restaurant was definitely family friendly, our baby had decided that he was very much not restaurant friendly. I don’t know what his problem was, we gave him soft chunks of artisanal bread to chew on – artisanal! A seven month old who is too good for artisanal bread, what kind of child am I raising? The bread was bloody delicious as well, he really missed out. The crust was crispy with a crunchy coating of salt and rosemary (fear not baby weaning experts, I cut off the salty crust before giving it to the baby) while the inside was chewy and dense. We polished the lot off with some rosemary olive oil; meanwhile the baby threw most of his on the floor then burst into tears all in approximately 1 minute (and I’m being generous with the time). The bread is laid out on a big slab at the front of the restaurant and is enormous, it’s cooked fresh in the restaurant and is similar to focaccia. But a really, really good focaccia, not one you’d pick up from the supermarket in vacuum packed plastic to go with your soup. Our mains were accompanied by crying and the dulcet tones of VTech’s Singing Alfie Bear who kindly offered several times to teach our baby ‘1,2,3’ and pathetically kept telling him that “I love you” (seriously Alfie, cool it) all while singing ‘delightful’ nursery rhymes to try and placate him. As you can imagine the other diners were thrilled at the unique soundtrack we provided for their meal. 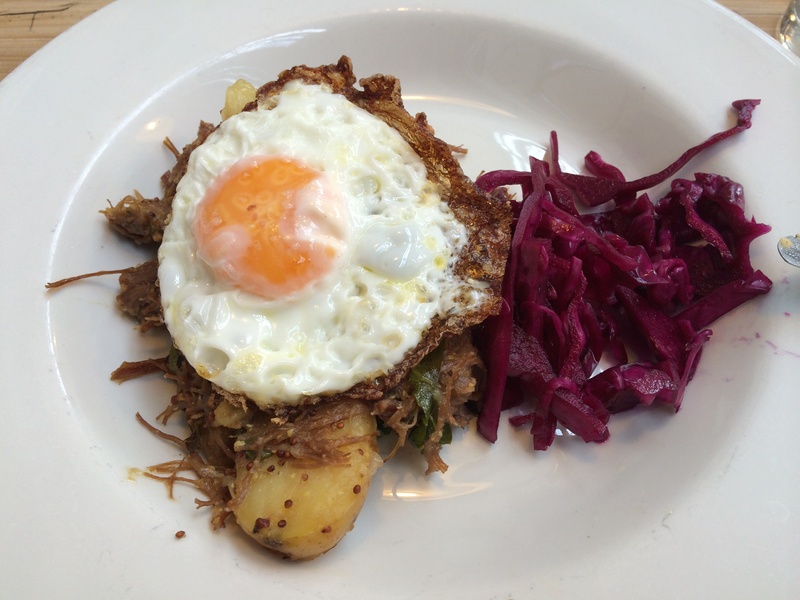 We both had the salt beef brisket hash with pickled red cabbage and a fried egg. We both agreed that it was a handsome dish; the beef was shredded and tender, with a salt and mustard flavour. Although there was no sauce, the dish still managed to be moist and the pickled cabbage added some acidity and kept the dish feeling fresh. My fried egg was extra crispy which was good, but on the negative side the yolk was very nearly cooked all the way through. I am super fussy with eggs though, the white has to be completely cooked with no trace in sight of the dreaded ‘snotty egg white’ that you always get around the yolk with fried eggs, and then the yolk has to be really runny. Am I asking the impossible? The Boyfriend happily eats boiled eggs that have loads of undercooked whites in them while I look on in horror whilst eating what he calls burnt eggs. Overcooked they may be but at least I won’t be retching over my breakfast. I can’t perfect boiled and fried eggs myself, they are always slightly overcooked, but I’ve had no professional training so I’ve got a great excuse for consistently messing up my breakfast. We each took it in turns to attempt one handed eating while rocking the baby or taking him for a walk around the restaurant to distract him from his very successful attempts to stop us eating hot food together as a family. Even though part of me was desperate to get out of there and walk him around in his buggy like he likes to do so he can have a good stare at everything, I was also determined to see the meal through to the bitter end and not give him the satisfaction of us abandoning dinner, so glutton for punishment (and also food) that I am, I ordered dessert. There were plenty of tasty sounding desserts on offer but I managed to pick parsnip and butterscotch pudding with vanilla ice cream. As a carrot cake lover the idea of a parsnip pudding didn’t seem too out there, especially when you consider how sweet parsnips can be and how often they are paired up with maple syrup or honey when roasted. I have to say, as good as the parsnip and butterscotch pudding was, it was nothing remarkable or memorable. The sponge was light, the sweet flavour of the parsnip shone through and there was also a touch of spice nestled in there, possibly cinnamon or ginger which really brought out the flavour of the parsnip. The butterscotch sauce ticked all the boxes, sugary and deeply sweet and the ice cream was smooth and creamy. Can’t fault the pudding in that respect, but rather than being a restaurant dessert it felt like a dish anyone could easily whip up at home for pudding after a Sunday roast. Satisfying, comforting and sweet, but not a revelation. I would happily make this dessert myself one day, or one similar to it, on a cold winters day. Whilst I was eating my pudding, the baby decided he’d push all his toys onto the floor, cry when they were no longer within his grasp, then when he got them back he’d start the cycle all over again. Delightful. So Hugh Fearnley Whittingstall’s River Cottage Canteen gets a big thumbs up from me, but a big thumbs down from the baby. Good, honest food without bucket loads of pretension that makes you feel happy and contented, and (bonus) not stupidly full. The next day we had lunch at a service station on the way home, but despite the fact that services are the most miserable places to have lunch ever and I’d have totally shared in his misery had he been a grump, he behaved perfectly in his high chair while we ate flavourless noodles and drank from that ubiquitous coffee chain whose coffee is pretty dull (but this one does pay their taxes, so I suppose that’s something). Luckily back at home the two/three of us have lovely little lunches together as a family, where he sits in his highchair picking at fruit and crumpets while us grown-ups eat cheese on toast and dance like idiots to the radio to get him to laugh. This behaviour is frowned upon in restaurants though. Moral of the story: if you want a happy lunch with your baby, have it at home. Save the good stuff for when you’ve got babysitters.